(Nanowerk News) MIT chemists have devised a new way to wirelessly detect hazardous gases and environmental pollutants, using a simple sensor that can be read by a smartphone. These inexpensive sensors could be widely deployed, making it easier to monitor public spaces or detect food spoilage in warehouses. Using this system, the researchers have demonstrated that they can detect gaseous ammonia, hydrogen peroxide, and cyclohexanone, among other gases. Swager is the senior author of a paper describing the new sensors in the Proceedings of the National Academy of Sciences ("Wireless gas detection with a smartphone via rf communication"). Chemistry graduate student Joseph Azzarelli is the paper’s lead author; other authors are postdoc Katherine Mirica and former MIT postdoc Jens Ravnsbaek. The MIT researchers' wireless chemical sensor. For several years, Swager’s lab has been developing gas-detecting sensors based on devices known as chemiresistors, which consist of simple electrical circuits modified so that their resistance changes when exposed to a particular chemical. Measuring that change in resistance reveals whether the target gas is present. Unlike commercially available chemiresistors, the sensors developed in Swager’s lab require almost no energy and can function at ambient temperatures. “This would allow us to put sensors in many different environments or in many different devices,” Swager says. The new sensors are made from modified near-field communication (NFC) tags. 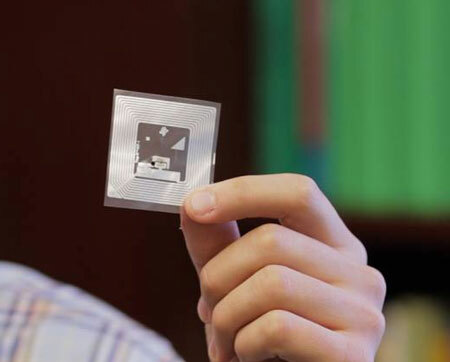 These tags, which receive the little power they need from the device reading them, function as wirelessly addressable barcodes and are mainly used for tracking products such as cars or pharmaceuticals as they move through a supply chain, such as in a manufacturing plant or warehouse. NFC tags can be read by any smartphone that has near-field communication capability, which is included in many newer smartphone models. These phones can send out short pulses of magnetic fields at radio frequency (13.56 megahertz), inducing an electric current in the circuit on the tag, which relays information to the phone. To adapt these tags for their own purposes, the MIT team first disrupted the electronic circuit by punching a hole in it. Then, they reconnected the circuit with a linker made of carbon nanotubes that are specialized to detect a particular gas. In this case, the researchers added the carbon nanotubes by “drawing” them onto the tag with a mechanical pencil they first created in 2012, in which the usual pencil lead is replaced with a compressed powder of carbon nanotubes. The team refers to the modified tags as CARDs: chemically actuated resonant devices. When carbon nanotubes bind to the target gas, their ability to conduct electricity changes, which shifts the radio frequencies at which power can be transferred to the device. When a smartphone pings the CARD, the CARD responds only if it can receive sufficient power at the smartphone-transmitted radio frequencies, allowing the phone to determine whether the circuit has been altered and the gas is present. Current versions of the CARDs can each detect only one type of gas, but a phone can read multiple CARDs to get input on many different gases, down to concentrations of parts per million. With the current version of the technology, the phone must be within 5 centimeters of the CARD to get a reading, but Azzarelli is currently working with Bluetooth technology to expand the range. The researchers have filed for a patent on the sensing technology and are now looking into possible applications. Because these devices are so inexpensive and can be read by smartphones, they could be deployed nearly anywhere: indoors to detect explosives and other harmful gases, or outdoors to monitor environmental pollutants. Once an individual phone gathers data, the information could be uploaded to wireless networks and combined with sensor data from other phones, allowing coverage of very large areas, Swager says. The researchers are also pursuing the possibility of integrating the CARDs into “smart packaging” that would allow people to detect possible food spoilage or contamination of products. Swager’s lab has previously developed sensors that can detect ethylene, a gas that signals ripeness in fruit. The CARDs could also be incorporated into dosimeters to help monitor worker safety in manufacturing plants by measuring how much gas the workers are exposed to. “Since it’s low-cost, disposable, and can easily interface with a phone, we think it could be the type of device that someone could wear as a badge, and they could ping it when they check in in the morning and then ping it again when they check out at night,” Azzarelli says.